SMMA Sixth Form Students Win at Best Fantasy Budget Challenge. 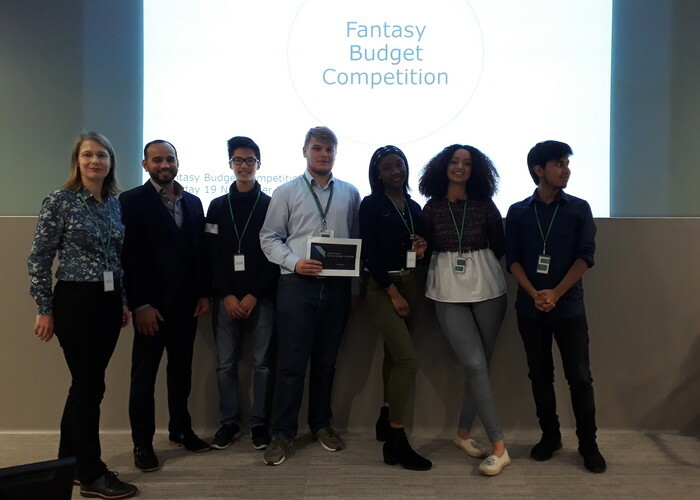 Congratulations to our team of Sixth Form Economics students who recently competed with peers from across the UK in a challenge to create the best 'fantasy budget'. Our Year 13 students were given the task of redesigning the UK government's spending and taxation policies. Coached by Deloitte mentor Fauwaz Lahori, our Sixth Formers rose to this complex challenge. Their suite of ambitious policies focusing on the long-term prosperity of the UK was judged the best by a team of experts from Deloitte. • reducing government borrowing by increasing taxes on the wealthy and decreasing foreign aid. • giving businesses increased certainty through the Brexit introductory period by setting a cap on interest rates. • supporting long-term growth, by allocating some of the increased tax revenue to investment in infrastructure and education. Congratulations and well done to our winning team of SMMA Sixth Form student economists: Charlie, Abiola, Isabella, Randall and Miguel. Their prize is a day out and delicious lunch at a London landmark! Applications for SMMA Sixth Form 2019 are now open. Apply here! Find out what makes us 'One of the best Sixth Forms in London' and apply here.